Over the past several years, the construction industry has experienced a period of rapidly changing technologies and regulations. 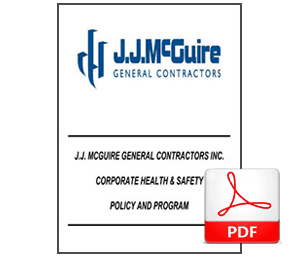 At JJ McGuire General Contractors, the safety of our workers, as well as safe conditions and practices on our worksites, are of the highest priority and every reasonable precaution shall be taken to provide such an environment. All supervisors on our sites, whether working directly for or sub contractually to JJ McGuire General Contractors, are expected to perform their duties and responsibilities in a manner which ensures that workers under their authority have the knowledge, training, or experience to perform their job tasks in the safest manner possible. All supervisors must ensure their workers are familiar with the actual and potential hazards of the job and have an understanding of the safety standards and regulations that apply to their work. It is our desire that every person affiliated in any way on our worksites follow our Corporate Health and Safety Policy and Procedures Manual. We welcome any suggestions on how we might improve our safety program. We expect everyone to work together as a team to maintain and improve our safe working environment. At J. J. McGuire General Contractors safety is everyone’s business. Full-time safety professionals oversee the implementation of our strict safety policy. All operations are subject to continuous audits of safety management systems, accident frequency, and workers compensation costs. JJ McGuire is a member contractor of ISN® and its online contractor management database, ISNetworld. This system is designed to meet internal and governmental record keeping and compliance requirements. ISN is the global leader in contractor and supplier management. We are also registered with the Certificate of Recognition (COR™) program. COR™ is nationally trademarked and endorsed by participating members of the Canadian Federation of Construction Safety Associations (CFCSA) and the Infrastructure Health and Safety Association (IHSA). It provides employers with an effective tool to assess their health and safety management system. It is currently being used across Canada and is a pre-qualification requirement for many contractors working in and out of the province and on public- and private-sector projects.